In my opinion, there's just no better chocolate than Hershey's. I've tried several of their recipes and every single one of them is a showstopper. Usually, I would try a new recipe and then put my own personal twist on it. But when it comes to Hershey's recipes, you just can't. Basically, "if it ain't broke, don't fix it." This is one of my all time favorites and as soon as you try it, you'll understand why. 1. Prepare FILLING (recipe follows). set aside. Heat oven to 350°F. Line muffin cups (2-1/2 inches in diameter) with paper bake cups. 2. Stir together flour, sugar, cocoa, baking soda and salt in large bowl. Add water, oil, vinegar and vanilla; beat on medium speed of mixer 3 minutes. Fill muffin cups 2/3 full with batter. Spoon 1 level tablespoon FILLING into center of each cupcake. 3. Bake 20 to 25 minutes or until wooden pick inserted in cake portion comes out clean. Remove from pan to wire rack. Cool completely. About 2-1/2 dozen cupcakes. Beat cream cheese, sugar, egg and salt in small bowl until smooth and creamy. Stir in chocolate chips. GOBLIN'S DELIGHT FILLING: Add 2 teaspoons grated orange peel, 4 drops yellow food color and 3 drops red food color to FILLING before stirring in chips. VALENTINE FILLING: Stir 4 to 5 drops red food color into FILLING. PEANUT BUTTER CHIP FILLING: Omit chocolate; stir in 1 cup REESE'S Peanut Butter Chips. I prefer to have the filling in the center of the cupcake as opposed to sitting on top. 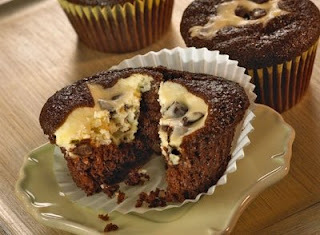 So, before baking them, I always push the filling down into the cupcake so that it's submerged under the cupcake batter. This allows for the cupcake batter to bake over the filling.